The Arctic Council planning a search for Sir John Franklin by Stephen Pearce, 1851. Left to right are: George Back, William Edward Parry, Edward Bird, James Clark Ross, Francis Beaufort (seated), John Barrow Jnr, Edward Sabine, William Alexander Baillie Hamilton, John Richardson and Frederick William Beechey. Map of the probable routes taken by HMS Erebus and HMS Terror during Franklin's lost expedition. Disko Bay is about 3,200 kilometres (2,000 mi) from the mouth of the Mackenzie River. Sir John Barrow promoted Arctic voyages of discovery during his long tenure as Second Secretary to the Admiralty. Sir John Franklin was Barrow's reluctant choice to lead the expedition. Portrait of Jane Griffin (later Lady Franklin), 24, in 1815. 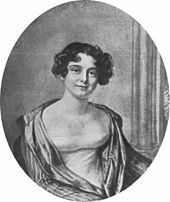 She married John Franklin in 1828, a year before he was knighted. Captain F. R. M. Crozier, executive officer for the expedition, commanded HMS Terror. Pressed by Franklin's wife, Jane, Lady Franklin, and others, the Admiralty launched a search for the missing expedition in 1848. Prompted in part by Franklin's fame and the Admiralty's offer of a finder's reward, many subsequent expeditions joined the hunt, which at one point in 1850 involved eleven British and two American ships. Several of these ships converged off the east coast of Beechey Island, where the first relics of the expedition were found, including the graves of three crewmen. In 1854, explorer John Rae, while surveying near the Canadian Arctic coast southeast of King William Island, acquired relics of and stories about the Franklin party from local Inuit. A search led by Francis McClintock in 1859 discovered a note left on King William Island with details about the expedition's fate. Searches continued through much of the 19th century. In 2014, a Canadian search team led by Parks Canada located the wreck of Erebus west of O'Reilly Island, in the eastern portion of Queen Maud Gulf, in the waters of the Arctic archipelago. Two years later, the Arctic Research Foundation found the wreck of Terror south of King William Island. Research and dive expeditions at the wreck sites are currently ongoing. In 1981, a team of scientists led by Owen Beattie, a professor of anthropology at the University of Alberta, began a series of scientific studies of the graves, bodies, and other physical evidence left by Franklin's men on Beechey Island and King William Island. They concluded that the men buried on Beechey Island most likely died of pneumonia and perhaps tuberculosis, and that lead poisoning may have worsened their health, owing to badly soldered cans held in the ships' food stores. It was later suggested that the source of this lead may not have been tinned food, but the distilled water systems fitted to the ships. However, studies in 2013 and 2016 suggested that lead poisoning was likely not a factor, and that the crew's ill health may, in fact, have been due to malnutrition – specifically zinc deficiency – possibly due to a lack of meat in their diet. Cut marks on human bones found on King William Island were seen as signs of cannibalism. The combined evidence of all the studies suggested that the crewmen did not all die quickly. Hypothermia, starvation, lead poisoning or zinc deficiency, and diseases including scurvy, along with general exposure to a hostile environment whilst lacking adequate clothing and nutrition, killed everyone on the expedition in the years following its last sighting by Europeans in 1845. The Victorian media portrayed Franklin as a hero despite the expedition's failure and the reports of cannibalism. Songs were written about him, and statues of him in his home town of Spilsby, in London, and in Tasmania credit him with discovery of the Northwest Passage, although in reality it was not traversed until Roald Amundsen's 1903–1906 expedition. Franklin's lost expedition has been the subject of many artistic works, including songs, verse, short stories, and novels, as well as television documentaries. The search by Europeans for a western shortcut by sea from Europe to Asia began with the voyages of Christopher Columbus in 1492 and continued through the mid-19th century with a long series of exploratory expeditions originating mainly in England. These voyages, when to any degree successful, added to the sum of European geographic knowledge about the Western Hemisphere, particularly North America, and as that knowledge grew larger, attention gradually turned toward the Arctic. Voyagers of the 16th and 17th centuries who made geographic discoveries about North America included Martin Frobisher, John Davis, Henry Hudson, and William Baffin. In 1670, the incorporation of the Hudson's Bay Company led to further exploration of the Canadian coasts and interior and of the Arctic seas. In the 18th century, explorers included James Knight, Christopher Middleton, Samuel Hearne, James Cook, Alexander MacKenzie, and George Vancouver. By 1800, their discoveries showed conclusively that no Northwest Passage navigable by ships lay in the temperate latitudes between the Pacific and the Atlantic Oceans. In 1804, Sir John Barrow became Second Secretary of the Admiralty, a post he held until 1845, and began a push by the Royal Navy to complete the Northwest Passage over the top of Canada and to navigate toward the North Pole. Over the next four decades, explorers including John Ross, David Buchan, William Edward Parry, Frederick William Beechey, James Clark Ross, George Back, Peter Warren Dease, and Thomas Simpson made productive trips to the Canadian Arctic. Among these explorers was John Franklin, second-in-command of an expedition towards the North Pole in the ships Dorothea and Trent in 1818 and the leader of overland expeditions to and along the Arctic coast of Canada in 1819–22 and 1825–27. By 1845, the combined discoveries of all of these expeditions had reduced the relevant unknown parts of the Canadian Arctic to a quadrilateral area of about 181,300 km2 (70,000 sq mi). It was into this unknown area that Franklin was to sail, heading west through Lancaster Sound and then west and south as ice, land, and other obstacles might allow, to complete the Northwest Passage. The distance to be navigated was roughly 1,670 kilometres (1,040 mi). Barrow, who was 82 and nearing the end of his career, deliberated about who should command the expedition to complete the Northwest Passage and perhaps also find what Barrow believed to be an ice-free Open Polar Sea around the North Pole. Parry, his first choice, was tired of the Arctic and politely declined. His second choice, James Clark Ross, also declined because he had promised his new wife he was done with the Arctic. Barrow's third choice, James Fitzjames, was rejected by the Admiralty on account of his youth. Barrow considered George Back but thought he was too argumentative. Francis Crozier, another possibility, was of humble birth and Irish, which counted against him. Reluctantly, Barrow settled on the 59-year-old Franklin. The expedition was to consist of two ships, HMS Erebus and HMS Terror, each of which had seen Antarctic service with James Clark Ross. Franklin was given command of Erebus, and Crozier, who had commanded Terror during the Antarctica expedition with Ross in 1841–44, was appointed the executive officer and commander of Terror. Franklin received his expedition command on 7 February 1845, and his official instructions on 5 May 1845. Erebus at 378 tons (bm) and Terror at 331 tons (bm) were sturdily built, and were outfitted with recent inventions. Steam engines were fitted in to drive a single screw in each vessel; these engines were former locomotives from the London & Croydon Railway. They enabled the ships to make 7.4 km/h (4 kn) on their own power. Other advanced technology included bows reinforced with heavy beams and plates of iron, an internal steam heating device for the comfort of the crew, screw propellers and iron rudders that could be withdrawn into iron wells to protect them from damage, ships' libraries of more than 1,000 books, and three years' worth of conventionally preserved or tinned preserved food supplies. The latter was supplied from a provisioner, Stephen Goldner, who was awarded the contract on 1 April 1845, a mere seven weeks before Franklin set sail. Goldner worked frantically on the large and hasty order of 8,000 tins. The speed required affected quality control of a proportion of the tins manufactured, which were later found to have lead soldering that was "thick and sloppily done, and dripped like melted candle wax down the inside surface". Most of the crew were Englishmen, many of them from Northern England, as well as a small number of Irishmen and Scotsmen. Aside from Franklin, Crozier, and Lieutenant Graham Gore, the only other officers who were Arctic veterans were an assistant surgeon and the two icemasters. Thomas Plater Stoker Westminster, Middx. ∗ Written with the first "s" as an "f" in Victorian manner i.e. : "Clofsan"; Cyriax reads "Closson." ¤ First name read as "David" in Cyriax crewlist. † This name appears twice in the original list. ‡ McClintock spells this as "Birt." ∞ Returned to England from the Whalefish Islands in the Barretto Junior. ∗ First name read as "David" in Cyriax crewlist. † This name is not in the Muster Books but is taken from Cyriax. I remarked to Gibson as we rode along that this was the anniversary of Burke's and Wills's return to their depot at Coopers' Creek and then recited to him, as he did not appear to know anything whatever about it, the hardships they endured, their desperate struggles for existence and death there; and casually remarked that Mr Wills had a brother [sic] who also lost his life in the field of discovery, as he went out with Sir John Franklin in 1845. Gibson then remarked, "Oh, I had a brother who died with Franklin at the North Pole and my father had a great deal of trouble getting his pay from Government". The expedition set sail from Greenhithe, England, on the morning of 19 May 1845, with a crew of 24 officers and 110 men. The ships stopped briefly in Stromness harbour in the Orkney Islands in northern Scotland, and from there they sailed to Greenland with HMS Rattler and a transport ship, Baretto Junior; the passage to Greenland took 30 days. At the Whalefish Islands in Disko Bay, on the west coast of Greenland, ten oxen carried by the transport ship were slaughtered for fresh meat; supplies were transferred to Erebus and Terror, and crew members wrote their last letters home. Letters written on board told how Franklin banned swearing and drunkenness. Before the expedition's final departure, five men were discharged and sent home on Rattler and Barretto Junior, reducing the ships' final crew size to 129. The expedition was last seen by Europeans in late July 1845, when Captain Dannett of the whaler Prince of Wales and Captain Robert Martin of the whaler Enterprise encountered Terror and Erebus in Baffin Bay, waiting for good conditions to cross to Lancaster Sound. Over the next 150 years, other expeditions, explorers, scientists and interviews from native Inuit peoples would piece together what happened next. Franklin's men wintered in 1845–46 on Beechey Island, where three crew members died and were buried. After traveling down Peel Sound through the summer of 1846, Terror and Erebus became trapped in ice off King William Island in September 1846 and are believed to have never sailed again. According to a note dated 25 April 1848, and left on the island by Fitzjames and Crozier, Franklin had died on 11 June 1847; the crew had wintered off King William Island in 1846–47 and 1847–48, and the remaining crew had planned to begin walking on 26 April 1848 toward the Back River on the Canadian mainland. Nine officers and fifteen men had already died; the rest would die along the way, most on the island and another 30 or 40 on the northern coast of the mainland, hundreds of miles from the nearest outpost of Western civilization. After two years had passed with no word from Franklin, public concern grew and Lady Franklin—as well as members of Parliament and British newspapers—urged the Admiralty to send a search party. Although the Admiralty said it did not feel any reason to be alarmed, it responded by developing a three-pronged plan put into effect in the spring of 1848 that sent an overland rescue party, led by Sir John Richardson and John Rae, down the MacKenzie River to the Canadian Arctic coast. Two expeditions by sea were also launched, one led by Sir James Clark Ross entering the Canadian Arctic archipelago through Lancaster Sound, and the other, commanded by Henry Kellett, entering from the Pacific side. 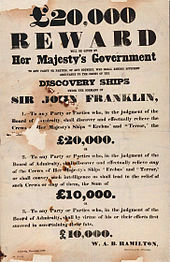 In addition, the Admiralty offered a reward of £20,000 (£1,972,400 as of 2019) "to any Party or Parties, of any country, who shall render assistance to the crews of the Discovery Ships under the command of Sir John Franklin". After the three-pronged effort failed, British national concern and interest in the Arctic increased until "finding Franklin became nothing less than a crusade." Ballads such as "Lady Franklin's Lament", commemorating Lady Franklin's search for her lost husband, became popular. Many joined the search. In 1850, eleven British and two American ships cruised the Canadian Arctic, including Breadalbane, and her sister ship HMS Phoenix. Several converged off the east coast of Beechey Island, where the first relics of the expedition were found, including remnants of a winter camp from 1845–46 and the graves of John Torrington, John Hartnell, and William Braine. No messages from the Franklin expedition were found at this site. In the spring of 1851, passengers and crew aboard several ships observed a huge iceberg off Newfoundland which bore two vessels, one upright and one on its beam ends. The ships were not examined closely. It was suggested at the time that the ships could have been Erebus and Terror, but it is now known that they were not; it is likely that they were abandoned whaling ships. In 1852, Edward Belcher was given command of the government Arctic expedition in search of Sir John Franklin. This was unsuccessful; Belcher's inability to render himself popular with his subordinates was peculiarly unfortunate in an Arctic voyage, and he was not wholly suited to command vessels among ice. Four of the five ships (HMS Resolute, Pioneer, Assistance and Intrepid) were abandoned in pack ice, for which Belcher was court-martialed but acquitted. One of those ships, HMS Resolute, was later recovered intact by an American whaler and returned to the United Kingdom. Timbers from the ship were later used to manufacture three desks, one of which, the Resolute desk, was presented by Queen Victoria to the U.S. President Rutherford B. Hayes; it has often been chosen by presidents for use in the Oval Office in the White House. John Rae acquired the first Franklin expedition relics from the Inuit and reported on starvation and cannibalism among the dying crewmen. The American explorer Charles Francis Hall, who twice searched for Franklin and his men. In 1854, John Rae, while surveying the Boothia Peninsula for the Hudson's Bay Company (HBC), discovered further evidence of the expedition's fate. Rae met an Inuk near Pelly Bay (now Kugaaruk, Nunavut) on 21 April 1854, who told him of a party of 35 to 40 white men who had died of starvation near the mouth of the Back River. Other Inuit confirmed this story, which included reports of cannibalism among the dying sailors. The Inuit showed Rae many objects that were identified as having belonged to Franklin and his men. In particular, Rae brought from the Inuit several silver forks and spoons later identified as belonging to Franklin, Fitzjames, Crozier, and Robert Osmer Sargent, a shipmate aboard Erebus. 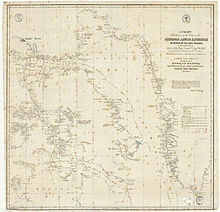 Rae's report was sent to the Admiralty, which in October 1854 urged the HBC to send an expedition down the Back River to search for other signs of Franklin and his men. Next were Chief Factor James Anderson and HBC employee James Stewart, who travelled north by canoe to the mouth of the Back River. In July 1855, a band of Inuit told them of a group of qallunaat (Inuktitut for "whites") who had starved to death along the coast. In August, Anderson and Stewart found a piece of wood inscribed with "Erebus" and another that said "Mr. Stanley" (surgeon aboard Erebus) on Montreal Island in Chantrey Inlet, where the Back River meets the sea. Despite the findings of Rae and Anderson, the Admiralty did not plan another search of its own. Britain officially labelled the crew deceased in service on 31 March 1854. Lady Franklin, failing to convince the government to fund another search, personally commissioned one more expedition under Francis Leopold McClintock. The expedition ship, the steam schooner Fox, bought via public subscription, sailed from Aberdeen on 2 July 1857. In April 1859, sledge parties set out from Fox to search on King William Island. On 5 May, the party led by Royal Navy Lieutenant William Hobson found a document in a cairn left by Crozier and Fitzjames. It contained two messages. The first, dated 28 May 1847, said that Erebus and Terror had wintered in the ice off the northwest coast of King William Island and had wintered earlier at Beechey Island after circumnavigating Cornwallis Island. "Sir John Franklin commanding the Expedition. All well," the message said. The second message, written in the margins of that same sheet of paper, was much more ominous. Dated 25 April 1848, it reported that Erebus and Terror had been trapped in the ice for a year and a half and that the crew had abandoned the ships on 22 April. Twenty-four officers and crew had died, including Franklin on 11 June 1847, just two weeks after the date of the first note. Crozier was commanding the expedition, and the 105 survivors planned to start out the next day, heading south towards the Back River. This note contains significant errors; most notably, the date of the expedition's winter camp at Beechey Island is incorrectly given as 1846–47 rather than 1845–46. The McClintock expedition also found a human skeleton on the southern coast of King William Island. Still clothed, it was searched, and some papers were found, including a seaman's certificate for Chief Petty Officer Henry Peglar (b. 1808), Captain of the Foretop, HMS Terror. However, since the uniform was that of a ship's steward, it is more likely that the body was that of Thomas Armitage, gun-room steward on Terror and a shipmate of Peglar, whose papers he carried. At another site on the western extreme of the island, Hobson discovered a lifeboat containing two skeletons and relics from the Franklin expedition. In the boat was a large amount of abandoned equipment, including boots, silk handkerchiefs, scented soap, sponges, slippers, hair combs, and many books, among them a copy of The Vicar of Wakefield. McClintock also took testimony from the Inuit about the expedition's disastrous end. Two expeditions between 1860 and 1869 by Charles Francis Hall, who lived among the Inuit near Frobisher Bay on Baffin Island and later at Repulse Bay on the Canadian mainland, found camps, graves, and relics on the southern coast of King William Island, but he believed none of the Franklin expedition survivors would be found among the Inuit. In 1869 local Inuit took him to a shallow grave on King Edward Island containing well preserved skeletal remains and fragments of clothing. These remains were taken to England and interred beneath the Franklin Memorial at Greenwich Old Royal Naval College, London. The eminent biologist Thomas Henry Huxley examined the remains and it was concluded that the remains were those of HTD Le Vesconte, a lieutenant on HMS Erebus. An examination in 2009 suggested that these were the remains of Harry Goodsir, assistant surgeon on HMS Erebus. Although Hall concluded that all of the Franklin crew were dead, he believed that the official expedition records would yet be found under a stone cairn. With the assistance of his guides Ebierbing and Tookoolito, Hall gathered hundreds of pages of Inuit testimony. Among these materials are accounts of visits to Franklin's ships, and an encounter with a party of white men on the southern coast of King William Island near Washington Bay. In the 1990s, this testimony was extensively researched by David C. Woodman, and was the basis of two books, Unravelling the Franklin Mystery (1992) and Strangers Among Us (1995), in which he reconstructs the final months of the expedition. The hope of finding these lost papers led Lieutenant Frederick Schwatka of the U.S. Army to organise an expedition to the island between 1878 and 1880. Traveling to Hudson Bay on the schooner Eothen, Schwatka, assembling a team that included Inuit who had assisted Hall, continued north by foot and dog sled, interviewing Inuit, visiting known or likely sites of Franklin expedition remains, and wintering on King William Island. Although Schwatka failed to find the hoped-for papers, in a speech at a dinner given in his honour by the American Geographical Society in 1880, he noted that his expedition had made "the longest sledge journey ever made both in regard to time and distance" of 11 months and 4 days and 4,360 kilometres (2,710 mi), that it was the first Arctic expedition on which the whites relied entirely on the same diet as the Inuit, and that it established the loss of the Franklin records "beyond all reasonable doubt". The Schwatka expedition found no remnants of the expedition south of a place known as Starvation Cove on the Adelaide Peninsula. This was well north of Crozier's stated goal, the Back River, and several hundred miles away from the nearest Western outpost, on the Great Slave Lake. Woodman wrote of Inuit reports that between 1852 and 1858 Crozier and one other expedition member were seen in the Baker Lake area, about 400 kilometres (250 mi) to the south, where in 1948 Farley Mowat found "a very ancient cairn, not of normal Eskimo construction" inside which were shreds of a hardwood box with dovetail joints. East: James Clark Ross, (HMS Enterprise, HMS Investigator) only to Somerset Island because of ice. Center: Rae–Richardson Arctic Expedition Mackenzie River and along the coast. West: HMS Plover, HMS Herald to Bering Strait; William Pullen reaches Mackenzie by whaleboat. West: Richard Collinson (HMS Enterprise), Robert McClure (HMS Investigator) to Bering Strait. McClure frozen in at Banks Island and Investigator abandoned after two winters, crew trek east to Belcher expedition ships, becoming first Europeans to cross the northwest passage. Collinson reaches Coronation Gulf, furthest east of any ship. East: Horatio Austin (HMS Resolute), Erasmus Ommanney (HMS Assistance), plus 2 steam tenders, Pioneer and Intrepid (cpt John Bertie Cator 1850). Ommanney finds Franklin's Beechey Island camp. Austin's four and the below ships gather around Beechey Island, are frozen in and in spring send out sledge expeditions in all directions. They leave the Arctic before winter in 1851. East: Charles Forsyth (Prince Albert) financed by Lady Franklin; sledge on Somerset Island to Fury Beach. East: Edwin de Haven (USS Rescue, USS Advance) mounted the First Grinnell Expedition. William Kennedy (Prince Albert again) finds Bellot Strait proving that Somerset Island is an island. Edward Augustus Inglefield in northern Baffin Bay. Edward Belcher in five ships: HMS Assistance (Belcher), HMS Resolute (Henry Kellett), Pioneer (Sherard Osborn), Intrepid (Francis Leopold McClintock) and depot ship HMS North Star (William Pullen); much sledge exploration; rescues crew of HMS Investigator; all frozen in and abandoned except for North Star. Joined by supply ships Breadalbane, which would be crushed by ice, and HMS Phoenix, which with North Star took off crews of the other ships, including that of McClure's HMS Investigator, in 1854. Elisha Kane led the Second Grinnell Expedition. Boat expedition up the Wellington Channel under the command of R. M'Cormick, R.N., in HMB Forlorn Hope. John Rae learns where Franklin lost his ship. Anderson and Stewart descend the Back River and find relics in Chantry Inlet. Francis McClintock finds relics at King William Island, including the sole surviving written records of the Franklin expedition (the Victory Point and Gore Point records), and a ship's boat on runners containing two corpses. In June 1981, Owen Beattie, a professor of anthropology at the University of Alberta, began the 1845–48 Franklin Expedition Forensic Anthropology Project (FEFAP) when he and his team of researchers and field assistants travelled from Edmonton to King William Island, traversing the island's western coast as Franklin's men did 132 years before. FEFAP hoped to find artifacts and skeletal remains in order to use modern forensics to establish identities and causes of death among the lost 129. Although the trek found archaeological artifacts related to 19th-century Europeans and undisturbed disarticulated human remains, Beattie was disappointed that more remains were not found. Examining the bones of Franklin crewmen, he noted areas of pitting and scaling often found in cases of Vitamin C deficiency, the cause of scurvy. After returning to Edmonton, he compared notes from the survey with James Savelle, an Arctic archaeologist, and noticed skeletal patterns suggesting cannibalism. Seeking information about the Franklin crew's health and diet, he sent bone samples to the Alberta Soil and Feed Testing Laboratory for trace element analysis and assembled another team to visit King William Island. The analysis would find an unexpected level of 226 parts per million (ppm) of lead in the crewman's bones, which was 10 times higher than the control samples, taken from Inuit skeletons from the same geographic area, of 26–36 ppm. In June 1982, a team made up of Beattie and three students (Walt Kowall, a graduate student in anthropology at the University of Alberta; Arne Carlson, an archaeology and geography student from Simon Fraser University in British Columbia; and Arsien Tungilik, an Inuk student and field assistant) was flown to the west coast of King William Island where they retraced some of the steps of McClintock in 1859 and Schwatka in 1878–79. Discoveries during this expedition included the remains of between six and fourteen men in the vicinity of McClintock's "boat place" and artifacts including a complete boot sole fitted with makeshift cleats for better traction. After returning to Edmonton in 1982 and learning of the lead-level findings from the 1981 expedition, Beattie struggled to find a cause. Possibilities included the lead solder used to seal the expedition's food tins, other food containers lined with lead foil, food colouring, tobacco products, pewter tableware, and lead-wicked candles. He came to suspect that the problems of lead poisoning compounded by the effects of scurvy could have been lethal for the Franklin crew. However, because skeletal lead might reflect lifetime exposure rather than exposure limited to the voyage, Beattie's theory could be tested only by forensic examination of preserved soft tissue as opposed to bone. Beattie decided to examine the graves of the buried crewmen on Beechey Island. After obtaining legal permission, Beattie's team visited Beechey Island in August 1984 to perform autopsies on the three crewmen buried there. They started with the first crew member to die, Leading Stoker John Torrington. After completing Torrington's autopsy and exhuming and briefly examining the body of John Hartnell, the team, pressed for time and threatened by the weather, returned to Edmonton with tissue and bone samples. Trace element analysis of Torrington's bones and hair indicated that the crewman "would have suffered severe mental and physical problems caused by lead poisoning". Although the autopsy indicated that pneumonia had been the ultimate cause of the crewman's death, lead poisoning was cited as a contributing factor. During the expedition, the team visited a place about 1 km (0.6 mi) north of the grave site to examine fragments of hundreds of food tins discarded by Franklin's men. Beattie noted that the seams were poorly soldered with lead, which had likely come in direct contact with the food. The release of findings from the 1984 expedition and the photo of Torrington, a 138-year-old corpse well preserved by permafrost in the tundra, led to wide media coverage and renewed interest in the lost Franklin expedition. Subsequent research has suggested that another potential source for the lead may have been the ships' fresh-water systems rather than the tinned food. K.T.H. Farrer argued that "it is impossible to see how one could ingest from the canned food the amount of lead, 3.3 mg per day over eight months, required to raise the PbB to the level 80 μg/dL at which symptoms of lead poisoning begin to appear in adults and the suggestion that bone lead in adults could be 'swamped' by lead ingested from food over a period of a few months, or even three years, seems scarcely tenable." In addition, tinned food was in widespread use within the Royal Navy at that time and its use did not lead to any significant increase in lead poisoning elsewhere. However, and uniquely for this expedition only, the ships were fitted with converted railway locomotive engines for auxiliary propulsion which required an estimated one tonne of fresh water per hour when steaming. It is highly probable that it was for this reason that the ships were fitted with a unique water distillation system which, given the materials in use at the time, would have produced large quantities of water with a very high lead content. William Battersby has argued that this is a much more likely source for the high levels of lead observed in the remains of expedition members than the tinned food. A further survey of the graves was undertaken in 1986. A camera crew filmed the procedure, shown in Nova's television documentary, Buried in Ice in 1988. Under difficult field conditions, Derek Notman, a radiologist and medical doctor from the University of Minnesota, and radiology technician Larry Anderson took many X-rays of the crewmen prior to autopsy. Barbara Schweger, an Arctic clothing specialist, and Roger Amy, a pathologist, assisted in the investigation. Beattie and his team had noticed that someone else had attempted to exhume Hartnell. In the effort, a pickaxe had damaged the wooden lid of his coffin, and the coffin plaque was missing. Research in Edmonton later showed that Sir Edward Belcher, commander of one of the Franklin rescue expeditions, had ordered the exhumation of Hartnell in October 1852, but was thwarted by the permafrost. A month later, Edward A. Inglefield, commander of another rescue expedition, succeeded with the exhumation and removed the coffin plaque. Unlike Hartnell's grave, the grave of Private William Braine was largely intact. When he was exhumed, the survey team saw signs that his burial had been hasty. His arms, body, and head had not been positioned carefully in the coffin, and one of his undershirts had been put on backwards. The coffin seemed too small for him; its lid had pressed down on his nose. A large copper plaque with his name and other personal data punched into it adorned his coffin lid. The four graves at Franklin Camp near the harbor on Beechey Island, Nunavut Canada. (L-R) Three grave stones commemorate John Torrington, Wiliam Braine and John Hartnell of the Franklin Expedition. A fourth headstone marks the grave of a sailor named Thomas Morgan who came later in a Franklin search expedition and died at the camp. In 1992, a team of archaeologists and forensic anthropologists identified a site, which they referenced as "NgLj-2", on the western shores of King William Island. The site matches the physical description of Leopold McClintock's "boat place". Excavations there uncovered nearly 400 bones and bone fragments, and physical artefacts ranging from pieces of clay pipes to buttons and brass fittings. Examination of these bones by Anne Keenleyside, the expedition's forensic scientist, showed elevated levels of lead and many cut-marks "consistent with de-fleshing". On the basis of this expedition, it has become generally accepted that at least some groups of Franklin's men resorted to cannibalism in their final distress. On 18 June 2015, a study accepted for publication in the International Journal of Osteoarchaeology concluded that in addition to the de-fleshing of bones, 35 "bones had signs of breakage and 'pot polishing,' which occurs when the ends of bones heated in boiling water rub against the cooking pot they are placed in", which "typically occurs in the end stage of cannibalism, when starving people extract the marrow to eke out the last bit of calories and nutrition they can." In 1992, Franklin author David C. Woodman, with the help of magnetometer expert Brad Nelson, organised "Project Ootjoolik" to search for the wreck reported by Inuit testimony to lie off the waters of Adelaide Peninsula. Enlisting both a National Research Council and a Canadian Forces patrol aircraft, each fitted with a sensitive magnetometer, a large search area to the west of Grant Point was surveyed from an elevation of 200 feet (61 m). Over 60 strong magnetic targets were identified, of which five were deemed to have characteristics most congruent to those expected from Franklin's ships. In 1993, Dr. Joe McInnis and Woodman organised an attempt to identify the priority targets from the year before. A chartered aircraft landed on the ice at three of the locations, a hole was drilled through the ice, and a small sector-scan sonar was used to image the sea bottom. However, due to ice conditions and uncertain navigation, it was not possible to exactly confirm the locations of the holes, and nothing was found although hitherto-unknown depths were found at the locations that were consistent with Inuit testimony of the wreck. In 1994 Woodman organised and led a land search of the area from Richard Collinson Inlet to (modern) Victory Point in search of the buried "vaults" spoken of in the testimony of the contemporary Inuit hunter Supunger. A ten person team spent ten days in the search, sponsored by the Royal Canadian Geographical Society, and filmed by the CBC Focus North. No trace of the vaults was found. In 1995, an expedition was jointly organised by Woodman, George Hobson, and American adventurer Steven Trafton – with each party planning a separate search. Trafton's group travelled to the Clarence Islands to investigate Inuit stories of a "white man's cairn" there but found nothing. Dr. Hobson's party, accompanied by archaeologist Margaret Bertulli, investigated the "summer camp" found a few miles to the south of Cape Felix, where some minor Franklin relics were found. Woodman, with two companions, travelled south from Wall Bay to Victory Point and investigated all likely campsites along this coast, finding only some rusted cans at a previously unknown campsite near Cape Maria Louisa. In 1997, a "Franklin 150" expedition was mounted by the Canadian film company Eco-Nova to use sonar to investigate more of the priority magnetic targets found in 1992. The senior archaeologist was Robert Grenier, assisted by Margaret Bertulli, and Woodman again acted as expedition historian and search coordinator. Operations were conducted from the Canadian Coast Guard icebreaker Laurier. Approximately 40 square kilometres (15 sq mi) were surveyed, without result, near Kirkwall Island. When detached parties found Franklin relics – primarily copper sheeting and small items – on the beaches of islets to the north of O'Reilly Island the search was diverted to that area, but poor weather prevented significant survey work before the expedition ended. A documentary, Oceans of Mystery: Search for the Lost Fleet, was produced by Eco-Nova about this expedition. Three expeditions were mounted by Woodman to continue the magnetometer mapping of the proposed wreck sites: a privately sponsored expedition in 2001, and the Irish-Canadian Franklin Search Expeditions of 2002 and 2004. These made use of sled-drawn magnetometers working on the sea ice and completed the unfinished survey of the northern (Kirkwall Island) search area in 2001, and the entire southern O'Reilly Island area in 2002 and 2004. All of the high-priority magnetic targets were identified by sonar through the ice as geological in origin. In 2002 and 2004, small Franklin artefacts and characteristic explorer tent sites were found on a small islet northeast of O'Reilly Island during shore searches. In August 2008, a new search was announced, to be led by Robert Grenier, a senior archaeologist with Parks Canada. This search hoped to take advantage of the improved ice conditions, using side-scan sonar from a boat in open water. Grenier also hoped to draw from newly published Inuit testimony collected by oral historian Dorothy Harley Eber. Some of Eber's informants have placed the location of one of Franklin's ships in the vicinity of the Royal Geographical Society Island, an area not searched by previous expeditions. The search was to also include local Inuit historian Louie Kamookak, who has found other significant remains of the expedition and would represent the indigenous culture. HMS Investigator became icebound in 1853 while searching for Franklin's expedition and was subsequently abandoned. It was found in shallow water in Mercy Bay on 25 July 2010, along the northern coast of Banks Island in Canada's western Arctic. The Parks Canada team reported that it was in good shape, upright in about 11 metres (36 ft) of water. A new search was announced by Parks Canada in August 2013. On 1 September 2014, a larger search by a Canadian team under the banner of the "Victoria Strait Expedition" found two items on Hat Island in the Queen Maud Gulf near Nunavut's King William Island – a wooden object, possibly a plug for a deck hawse, the iron pipe through which the ship's chain cable would descend into the chain locker below; and part of a boat-launching davit bearing the stamps of two Royal Navy broad arrows. On 9 September 2014, the expedition announced that on 7 September it had located one of Franklin's two ships. The ship is preserved in good condition, with side-scan sonar picking up even the deck planking. The wreck lies in about 11 metres (36 ft) of water at the bottom of the eastern portion of Queen Maud Gulf, west of O'Reilly Island. On 1 October at the House of Commons, Prime Minister Stephen Harper confirmed that the wreck is indeed HMS Erebus. A documentary, Hunt for the Arctic Ghost Ship, was produced by Lion Television and broadcast in the UK in 2015. On 12 September 2016, it was announced that the Arctic Research Foundation expedition had found the wreck of HMS Terror south of King William Island in Terror Bay, at 68°54′13″N 98°56′18″W﻿ / ﻿68.90361°N 98.93833°W﻿ / 68.90361; -98.93833 at a depth of 24 metres (79 ft), and in "pristine" condition. The FEFAP field surveys, excavations and exhumations spanned more than 10 years. The results of this study from King William Island and Beechey Island artefacts and human remains showed that the Beechey Island crew had most probably died of pneumonia and perhaps tuberculosis, which was suggested by the evidence of Pott's disease discovered in Braine. Toxicological reports pointed to lead poisoning as a likely contributing factor. Blade cut marks found on bones from some of the crew were seen as signs of cannibalism. Evidence suggested that a combination of cold, starvation and disease including scurvy, pneumonia and tuberculosis, all made worse by lead poisoning, killed everyone in the Franklin party. More recent chemical re-examination of bone and nail samples taken from Hartnell and other crew members has cast doubt on the role of lead poisoning. A 2013 study determined that the levels of lead present in the crew members' bones had been consistent during their lives, and that there was no isotopic difference between lead concentrated within older and younger bone materials. Had the crew been poisoned by lead from the solder used to seal the canned food or from the ships' water supplies, both the concentration of lead and its isotopic composition would have been expected to have "spiked" during their last few months. This interpretation was supported by a 2016 study that suggested the crew's ill health may in fact have been due to malnutrition, and specifically zinc deficiency, probably due to a lack of meat in their diet. This study used micro-X-ray fluorescence to map the levels of lead, copper and zinc in Hartnell's thumbnail over the final months of his life, and found that apart from during his last few weeks lead concentrations within Hartnell's body were within healthy limits. In contrast, levels of zinc were far lower than normal and indicated that Hartnell would have been suffering from chronic zinc deficiency, sufficient to have severely suppressed his immune system and left him highly vulnerable to a worsening of the tuberculosis with which he was already infected. In the last few weeks of his life, his illness would have caused his body to start breaking down bone, fat and muscle tissues, releasing lead previously stored there into his bloodstream and giving rise to the high lead levels noted in previous analysis of soft tissues and hair. In 2017, Douglas Stenton, director for heritage in the Nunavut territory in north eastern Canada, suggested that four sets of European human remains found could possibly be women. He initially suspected that DNA testing would not offer up anything more, but to his surprise they registered that there was no 'Y' chromosomal element to the DNA. Stenton acknowledged that women were known to have served in the Royal Navy in the 17th, 18th and early 19th centuries, but he also pointed out that it could be that the DNA had simply degraded as further tests proved ambiguous. Stenton also stated that whilst the probability of four disguised women aboard the two ships was very, very low; he could not rule it out completely. Franklin's chosen passage down the west side of King William Island took Erebus and Terror into "a ploughing train of ice ... [that] does not always clear during the short summers", whereas the route along the island's east coast regularly clears in summer and was later used by Roald Amundsen in his successful navigation of the Northwest Passage. The Franklin expedition, locked in ice for two winters in Victoria Strait, was naval in nature and therefore not well-equipped or trained for land travel. Some of the crew members heading south from Erebus and Terror hauled many items not needed for Arctic survival. McClintock noted a large quantity of heavy goods in the lifeboat at the "boat place" and thought them "a mere accumulation of dead weight, of little use, and very likely to break down the strength of the sledge-crews". 1845–46: Expedition winters on Beechey Island. Three crewmen die of tuberculosis and are buried. 1847, 28 May: Date of first note, says "All well"
The most meaningful outcome of the Franklin expedition was the mapping of several thousand miles of hitherto unsurveyed coastline by expeditions searching for Franklin's lost ships and crew. As Richard Cyriax noted, "the loss of the expedition probably added much more [geographical] knowledge than its successful return would have done". At the same time, it largely quelled the Admiralty's appetite for Arctic exploration. There was a gap of many years before the Nares expedition and Sir George Nares' declaration there was "no thoroughfare" to the North Pole; his words marked the end of the Royal Navy's historical involvement in Arctic exploration, the end of an era in which such exploits were widely seen by the British public as worthy expenditures of human effort and monetary resources. Given how difficult and risky it was for professional explorers to cross the Northwest passage, it would be impossible for the average merchant ships of the day to use this route for trade. As a writer for The Athenaeum put it, "We think that we can fairly make out the account between the cost and results of these Arctic Expeditions, and ask whether it is worth while to risk so much for that which is so difficult of attainment, and when attained, is so worthless." The navigation of the Northwest Passage in 1903–05 by Roald Amundsen with the Gjøa expedition effectively ended the centuries-long quest for the Northwest Passage. 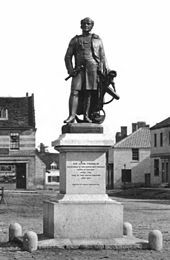 Statue of John Franklin in his home town of Spilsby, Lincolnshire, England. Statue of Francis Crozier in his home town of Banbridge, County Down. For years after the loss of the Franklin Party, the Victorian media portrayed Franklin as a hero who led his men in the quest for the Northwest Passage. A statue of Franklin in his home town bears the inscription "Sir John Franklin – Discoverer of the North West Passage", and statues of Franklin outside the Athenaeum in London and in Tasmania bear similar inscriptions. Although the expedition's fate, including the possibility of cannibalism, was widely reported and debated, Franklin's standing with the Victorian public was undiminished. The expedition has been the subject of numerous works of non-fiction. The mystery surrounding Franklin's last expedition was the subject of a 2006 episode of the NOVA television series Arctic Passage; a 2007 television documentary, "Franklin's Lost Expedition", on Discovery HD Theatre; as well as a 2008 Canadian documentary, Passage. In an episode of the 2009 ITV1 travel documentary series Billy Connolly: Journey to the Edge of the World, presenter Connolly and his crew visited Beechey Island, filmed the gravesite, and gave details of the Franklin expedition. NOVA revisited Franklin's expedition in the 2015 documentary "Arctic Ghost Ship," which covered the Victoria Strait Expedition and its use of Inuit testimony as well as the latest technology to successfully locate the Erebus. In memory of the lost expedition, one of Canada's Northwest Territories subdivisions was known as the District of Franklin. Including the high Arctic islands; this jurisdiction was abolished when the area was set off into the newly created Nunavut Territory on 1 April 1999. 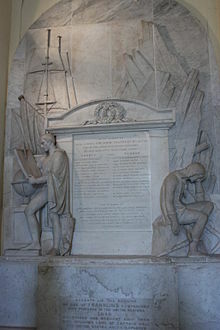 On 29 October 2009, a special service of thanksgiving was held in the chapel at the Old Royal Naval College in Greenwich, to accompany the rededication of the national monument to Franklin there. The service also included the solemn re-interment of the remains of Lieutenant Henry Thomas Dundas Le Vesconte, the only remains ever repatriated to England, entombed within the monument in 1873. The following day, a group of polar authors went to London's Kensal Green Cemetery to pay their respects to the Arctic explorers buried there. Many other veterans of the searches for Franklin are buried there too, including Admiral Sir Horatio Thomas Austin, Admiral Sir George Back, Admiral Sir Edward Augustus Inglefield, Admiral Bedford Pim, and Admiral Sir John Ross. Franklin's wife Jane Griffin, Lady Franklin, is also interred at Kensal Green in the vault, and commemorated on a marble cross dedicated to her niece Sophia Cracroft. From the 1850s through to the present day, Franklin's last expedition inspired numerous literary works. Among the first was a play, The Frozen Deep, written by Wilkie Collins with assistance and production by Charles Dickens. The play was performed for private audiences at Tavistock House early in 1857, as well as at the Royal Gallery of Illustration (including a command performance for Queen Victoria), and for the public at the Manchester Trade Union Hall. News of Franklin's death in 1859 inspired elegies, including one by Algernon Charles Swinburne. 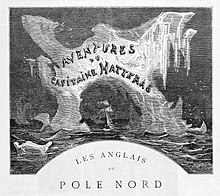 Fictional treatments of the final Franklin expedition begin with Jules Verne's Journeys and Adventures of Captain Hatteras, (1866), in which the novel's hero seeks to retrace Franklin's footsteps and discovers that the North Pole is dominated by an enormous volcano. Mark Twain briefly satirized the fate of the expedition and its subsequent searches in the beginning of the story "Some Learned Fables for Good Old Boys and Girls" (1875). The German novelist Sten Nadolny's The Discovery of Slowness (1983; English translation 1987) takes on the entirety of Franklin's life, touching only briefly on his last expedition. Other recent novelistic treatments of Franklin include William T. Vollmann's The Rifles (1994), John Wilson's North With Franklin: The Journals of James Fitzjames (1999); and Dan Simmons's The Terror (2007), which was developed as a 2018 AMC television series also called The Terror. The expedition has also been the subject of a horror role-playing game supplement, The Walker in the Wastes. Most recently, Clive Cussler's 2008 novel Arctic Drift incorporates the ordeal of the Franklin expedition as a central element in the story, and Richard Flanagan's Wanting (2009) deals with Franklin's deeds in both Tasmania and the Arctic. On 12 January 2012, BBC Radio 4 broadcast "Erebus," a radio play based on the Franklin expedition by British poet Jo Shapcott. Kassandra Alvarado's 2013 novel The White Passage present a vaguely science-fiction take on an alternative history of the lost expedition. In the visual arts, the loss of Franklin's expedition inspired a number of paintings in both the United States and Britain. In 1861, Frederic Edwin Church unveiled his great canvas The Icebergs; later that year, prior to taking it to England for exhibition, he added an image of a broken ship's mast in silent tribute to Franklin. In 1864, Sir Edwin Landseer's Man Proposes, God Disposes caused a stir at the annual Royal Academy exhibition; its depiction of two polar bears, one chewing on a tattered ship's ensign, the other gnawing on a human ribcage, was seen at the time as in poor taste, but has remained one of the most powerful imaginings of the expedition's final fate. The expedition also inspired numerous popular engravings and illustrations, along with many panoramas, dioramas, and magic lantern shows. Franklin's last expedition also inspired a great deal of music, beginning with the ballad "Lady Franklin's Lament" (also known as "Lord Franklin"), which originated in the 1850s and has been recorded by dozens of artists, among them Martin Carthy, Pentangle, Sinéad O'Connor, and The Pearlfishers. The British folk metal band Alestorm's song "Magnetic North" is dedicated to the expedition. Other Franklin-inspired songs include Fairport Convention's "I'm Already There", and James Taylor's "Frozen Man" (based on Beattie's photographs of John Torrington). Canadian composer Henry Kucharzyk's 1997 Terror and Erebus (A Lament for Franklin) is an oratorio for solo baritone and chamber ensemble. The first operatic treatment of the story is Terror & Erebus, a chamber opera for six singers and percussion quartet by Canadian composer Cecilia Livingston, to premiere in 2019. In 2009, traditional Irish composer and Sean Nós singer, Lorcán Mac Mathúna, working with composers Simon O Connor and Daire Bracken, composed a song cycle named Tásc is Tuairisc (Account and Death Notice) based on the expedition. A minimalist 30 minute cycle for voice, piano, and fiddle, in Irish, it tracks an individual's descent into madness and isolation. Two songs from the cycle, "Farraigí an Tuaiscirt" and "Cladach an Bháis" were released on the 2015 album Preab Meadar. The influence of the Franklin expedition on Canadian literature and culture has been especially significant. Among the best-known modern Franklin ballads is "Northwest Passage" by the late Ontario folksinger Stan Rogers (1981), which has been referred to as the unofficial Canadian national anthem. The distinguished Canadian novelist Margaret Atwood has also spoken of Franklin's expedition as a sort of national myth of Canada, remarking that "In every culture many stories are told, (but) only some are told and retold, and these stories bear examining ... in Canadian literature, one such story is the Franklin expedition." Notable treatments by Canadian poets include a verse play for radio, Terror and Erebus which was commissioned from Gwendolyn MacEwen, broadcast by CBC Radio (10 January 1965) and subsequently published in her collection Afterworlds (1987); and David Solway's verse cycle, Franklin's Passage (2003). The events have also featured prominently in Canadian novels, including Mordecai Richler's Solomon Gursky Was Here (1989) and Dominique Fortier's 2008 French language novel, Du bon usage des étoiles, which creatively considers the Franklin expedition from a variety of perspectives and genres and was both shortlisted and a finalist for several literary awards in Canada (2009 Governor General's Awards). Sheila Fischman's translation of Fortier's novel, On the Proper Use of Stars, was shortlisted for the 2010 Governor General's Awards for French to English Translation. Irish-Canadian writer Ed O'Loughlin's novel Minds of Winter was shortlisted for the 2017 Giller Prize. ^ Serle, Percival (1949). "Franklin, Jane, Lady (1792–1875)". Dictionary of Australian Biography. Angus and Robertson. Retrieved 2 March 2008 – via Project Gutenberg Australia. ^ Neatby, Leslie H. & Mercer, Keith. "Sir John Franklin". The Canadian Encyclopedia. Historica Canada. Retrieved 18 September 2015. ^ "Franklin expedition ship found in Arctic ID'd as HMS Erebus". CBC News. 1 October 2014. Retrieved 4 January 2019. ^ a b Watson, Paul (12 September 2016). "Ship found in Arctic 168 years after doomed Northwest Passage attempt". The Guardian. Retrieved 12 September 2016. ^ a b Battersby, William (2008). "Identification of the Probable Source of the Lead Poisoning Observed in Members of the Franklin Expedition" (PDF). Journal of the Hakluyt Society. Retrieved 25 November 2008. ^ a b c d e Witze, Alexandra (8 December 2016). "Fingernail absolves lead poisoning in death of Arctic explorer". Nature. doi:10.1038/nature.2016.21128. Retrieved 15 May 2018. ^ Savours 1999, pp. 1–38. ^ Savours 1999, pp. 39–166. ^ Savours 1999, p. 169. ^ Cyriax 1939, pp. 18–23. ^ a b c d e f Sandler 2006, pp. 65–74. ^ Gibson, William, F.R.G.S. (June 1937). "Sir John Franklin's Last Voyage: A brief history of the Franklin expedition and the outline of the researches which established the facts of its tragic outcome". The Beaver: 48. ^ Sandler 2006, p. 70. ^ Savours 1999, p. 180. ^ Sandler 2006, pp. 71–73. ^ Beattie & Geiger 1987, pp. 25, 158. ^ Beattie & Geiger 1987, p. 113. ^ Cookman 2000, p. 74. ^ Owen, Roderick (1978). The fate of Franklin. London: Hutchinson. p. 236. ISBN 978-0-09-131190-2. ^ Cyriax, Richard J. (1958). 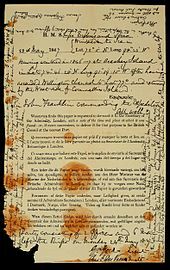 "The Two Franklin Expedition Records Found on King William Island". The Mariner's Mirror. 44 (3): 186. doi:10.1080/00253359.1958.10658393. ^ "SIR JOHN FRANKLIN'S EXPEDITION". The Morning Post. 25 October 1845. p. 5. Retrieved 31 October 2018 – via Newspapers.com. ^ Cyriax 1939, pp. 66–68. ^ Beattie & Geiger 1987, pp. 19–50. ^ "Sir John Franklin's Expedition". Sheffield and Rotherham Independent. 13 November 1847. p. 3. Retrieved 4 February 2019 – via Newspapers.com. ^ Savours 1999, pp. 186–89. ^ Sandler 2006, p. 80. ^ Sandler 2006, pp. 87–88. ^ Sandler 2006, p. 266. ^ Potter, Russell A. "Songs and Ballads About Sir John Franklin". Retrieved 26 February 2008. ^ Sandler 2006, p. 102. ^ Geiger, John (9 December 1984). "'Iceman' Torrington Was Last of His Line". The Edmonton Sun. ^ Geiger, John (3 October 1984). "Was Murder Uncovered?". The Edmonton Sun. ^ Picard, Carol (10 October 1984). "Iceman Wasn't 'Iced' – Autopsy on Seaman Reveals No Evidence of Foul Play". The Edmonton Sun. ^ Gould 1928, pp. 52–81. ^ "Arctic Blue Books – British Parliamentary Papers Abstract, 1852k". Great Britain House of Commons. 1852. Retrieved 10 September 2014. ^ Mowat 1973, p. 285. ^ Reardon, Sara (12 July 2011). "Skeleton May Help Solve Mystery of Doomed Franklin Expedition". Science. Retrieved 19 September 2015. ^ a b c Klutschak & Barr 1989, pp. xv–xvi. ^ Savours 1999, pp. 270–277. ^ Cookman 2000, p. 2. ^ Cookman 2000, pp. 8–9. ^ Savours 1999, p. 292. ^ "NOVA Arctic Passage – The Note in the Cairn (transcript)". PBS. Archived from the original on 31 March 2015. Retrieved 31 January 2008. ^ Woodman 1995, p. 5. ^ Savours 1999, pp. 295–296. ^ Beattie & Geiger 1987, pp. 34–40. ^ Schwatka 1965, pp. 12–15. ^ a b Schwatka 1965, pp. 115–116. ^ Woodman 1992, p. 317. ^ Woodman was unable to track down the origin of these Inuit reports, and the builder or origins of the cairn found by Mowat are unknown. ^ Beattie & Geiger 1987, pp. 51–52. ^ Beattie & Geiger 1987, p. 58. ^ Beattie & Geiger 1987, p. 56. ^ Beattie & Geiger 1987, pp. 58–62. ^ Beattie & Geiger 1987, p. 83. ^ Beattie & Geiger 1987, p. 63. ^ Beattie & Geiger 1987, pp. 77–82. ^ Beattie & Geiger 1987, pp. 83–85. ^ Beattie & Geiger 1987, pp. 86–87. ^ Beattie & Geiger 1987, p. 85. ^ Beattie & Geiger 1987, pp. 111–120. ^ Beattie & Geiger 1987, p. 123. ^ Beattie & Geiger 1987, pp. 122–123. ^ Beattie & Geiger 1987, p. 158. ^ Kowall, W.A. ; Krahn, P.M. & Beattie, O. B. (1989). "Lead Levels in Human Tissues from the Franklin Forensic Project". International Journal Environmental Analytical Chemistry. 35 (2): 121. doi:10.1080/03067318908028385. ^ Farrer, K. T. H. (1993). "Lead and the Last Franklin Expedition". Journal of Archaeological Science. 20 (4): 399–409. doi:10.1006/jasc.1993.1024. ^ Beattie, Owen (1988). Buried in Ice (television). Beechey Island: WGHB and NOVA. ^ Beattie & Geiger 1987, pp. 130–145. ^ Beattie & Geiger 1987, p. 116. ^ Beattie & Geiger 1987, pp. 116–118. ^ Beattie & Geiger 1987, pp. 146–47. ^ Beattie & Geiger 1987, p. 150. ^ Beattie & Geiger 1987, p. 148. ^ a b Keenleyside, Anne; Bertulli, Margaret & Fricke, Henry C. (1997). "The Final Days of the Franklin Expedition: New Skeletal Evidence" (PDF). Arctic. 50 (1): 36–46. doi:10.14430/arctic1089. ISSN 0004-0843. Retrieved 30 April 2010. ^ Ghose, Tia (22 July 2015). "Cracked Bones Reveal Cannibalism by Doomed Arctic Explorers". Discovery Communications. Archived from the original on 29 May 2016. Retrieved 9 July 2018. ^ "Oceans Of Mystery Documentary". Oceans Discovery. Archived from the original on 10 September 2014. Retrieved 10 September 2014. ^ Moore, Charles (2004). "Irish-Canadian Franklin Search Expedition, 2004". Rhode Island College. Archived from the original on 5 June 2015. Retrieved 10 September 2014. ^ Grenier, Robert (1 May 2009). "Full Proposals for IPY 2007–2008 Activities". International Polar Year. Archived from the original on 29 April 2011. ^ Gilles, Rob (16 August 2008). "Canada to Search for Arctic Explorer's Ships". IAC Search & Media. Associated Press. Archived from the original on 26 August 2008. Retrieved 17 August 2008. ^ Collins, Nick (30 July 2010). "Sir John Franklin Search Ship Found". Telegraph. Archived from the original on 10 January 2015. Retrieved 1 August 2010. ^ "On the Hunt for a Missing Piece of Canadian History: Parks Canada Continues Search for Lost Franklin Ships" (Press release). CNW Group. 9 August 2013. Retrieved 19 May 2014. ^ "Victoria Strait Expedition". Parks Canada. 1 May 2015. Archived from the original on 4 October 2015. Retrieved 20 September 2015. ^ "Franklin Expedition Ship Pieces Believed Discovered in Arctic". CBC News. 8 September 2014. Archived from the original on 6 October 2014. Retrieved 9 September 2014. ^ AAP & Berney, Leila (12 September 2014). "1800s British Expedition Shipwreck Found in the Arctic". Australian Geographic. Archived from the original on 8 September 2015. Retrieved 18 November 2014. ^ "Lost Franklin Expedition Ship Found in the Arctic". CBC News. 9 September 2014. Retrieved 9 September 2014. ^ "British Ship Lost in Arctic 170 Years Ago Found - Video Dailymotion". Dailymotion. Retrieved 13 September 2014. ^ Chase, Steven (9 September 2014). "Finding of Franklin Ship Fuels Harper's New Nationalism". The Globe and Mail. Ottawa. Retrieved 10 September 2014. ^ "The Inuit Were Right: Shipwreck Find Confirms 168-Year-Old Oral History". Indian Country Today. 10 September 2014. ^ "Franklin Expedition Ship Found in Arctic ID'd as HMS Erebus". CBC News. 1 October 2014. ^ "Hunt for the Arctic Ghost Ship". Lion Television. Retrieved 3 January 2019. ^ "Hunt for the Arctic Ghost Ship". Channel 4. 4 August 2015. Retrieved 3 January 2019. ^ "Confirming the identity of HMS Terror". Parks Canada. August 2017. Retrieved 14 December 2018. ^ Amy, Roger; Bhatnagar, Rakesh; Damkjar, Eric & Beattie, Owen (15 July 1986). "The Last Franklin Expedition: Report of a Postmortem Examination of a Crew Member". Canadian Medical Association Journal. 135 (2): 115–117. PMC 1491204. PMID 3521821. ^ Notman, Derek N.H.; Anderson, Lawrence; Beattie, Owen B. & Amy, Roger (1987). "Arctic Paleoradiology: Portable Radiographic Examination of Two Frozen Sailors from the Franklin Expedition (1845–48)". American Journal of Roentgenology. 149 (2): 347–350. doi:10.2214/ajr.149.2.347. ISSN 0361-803X. PMID 3300222. ^ Kowall, Walter; Beattie, Owen B. & Baadsgaard, Halfdan (25 January 1990). "Did Solder Kill Franklin's Men?". Nature. 343 (6256): 319–320. Bibcode:1990Natur.343..319K. doi:10.1038/343319b0. ^ Kowall, W.A. ; Krahn, P.M. & Beattie, O. B. (29 June 1988). "Lead Levels in Human Tissues from the Franklin Forensic Project". International Journal Environmental Analytical Chemistry. 35 (2): 119–126. doi:10.1080/03067318908028385. ^ Beattie & Geiger 1987, pp. 161–63. ^ Martin, Ronald Richard; Naftel, Steven; Macfie, Sheila; Jones, Keith; Nelson, Andrew (2013). "Pb distribution in bones from the Franklin expedition: synchrotron X-ray fluorescence and laser ablation/mass spectroscopy". Applied Physics A. 111 (1): 23–29. Bibcode:2013ApPhA.111...23M. doi:10.1007/s00339-013-7579-5. ^ Christensen, Jennie R.; McBeth, Joyce M.; Sylvain, Nicole J.; Spence, Jody; Chan, Hing Man (2016). "Hartnell's time machine: 170-year-old nails reveal severe zinc deficiency played a greater role than lead in the demise of the Franklin Expedition". Journal of Archaeological Science: Reports. 16: 430–440. doi:10.1016/j.jasrep.2016.11.042. ^ Pope, Alexandra (16 December 2016). "Thumbnail 'time machine' provides new insight into demise of Franklin expedition". Canadian Geographic. Retrieved 15 May 2018. ^ Whipple, Tom (28 April 2017). "Arctic bones could rewrite a boy's own adventure tale". The Times (72209). p. 21. ISSN 0140-0460. ^ a b Beattie & Geiger 1987, p. 42. ^ Beattie & Geiger 1987, pp. 39–40. ^ Cyriax 1939, p. 198. ^ "unknown". The Athenaeum: 315. 1 October 1859. ^ "Arctic Ghost Ship". Retrieved 15 March 2019. ^ Lewis-Jones, Huw. "Nelsons of Discovery: Notes on the Franklin Monument in Greenwich" (PDF). Retrieved 19 May 2011. ^ Potter, Russell (30 July 2010). "Online Blog at McClure's Memorial in London". Russell Potter (blog). Retrieved 19 May 2011 – via Visionsnorth.blogspot.com. ^ "Erebus". BBC. 12 January 2012. Retrieved 10 September 2014. ^ Alvarado, Kassandra (2013). The White Passage. Smashwords. ISBN 9781301113293. Retrieved 13 September 2014. ^ Kucharzyk, Henry (17 June 1997). "Terror and Erebus (A Lament for Franklin)". Soundmakers, produced by Soundstreams. Retrieved 6 June 2016. ^ Livingston, Cecilia (2018). "Terror & Erebus, a chamber opera for six singers and percussion quartet". Retrieved 23 January 2018. ^ Gudgeon, Chris (2008). "Rogers, Stan". The Canadian Encyclopedia. Historica Foundation of Canada. Retrieved 2 March 2008. ^ Atwood 1995, p. 11. ^ www.editionsalto.com Archived 5 March 2016 at the Wayback Machine. ^ "Scotiabank Giller Prize | Ed O'Loughlin". Scotiabank Giller Prize. Retrieved 23 January 2018. Atwood, Margaret (1995). "Concerning Franklin and His Gallant Crew". Strange Things: The Malevolent North in Canadian Literature. Oxford: Clarendon Press. ISBN 978-0-19-811976-0. Beattie, Owen & Geiger, John (1987). Frozen in Time: Unlocking the Secrets of the Franklin Expedition. Saskatoon: Western Producer Prairie Books. ISBN 978-0-88833-303-2. Cookman, Scott (2000). Iceblink: The Tragic Fate of Sir John Franklin's Lost Polar Expedition. New York: John Wiley & Sons. ISBN 978-0-471-37790-0. Cyriax, Richard (1939). Sir John Franklin's Last Arctic Expedition; a Chapter in the History of the Royal Navy. London: Methuen & Co. OCLC 9183074. Gould, Rupert (1928). Oddities a Book of Unexplained Facts. London: P. Allan & Co. ISBN 9780766136205. Retrieved 19 May 2011. Klutschak, Heinrich & Barr, William (1989). Overland to Starvation Cove. Toronto: University of Toronto Press. ISBN 978-0-8020-5762-4. Mowat, Farley (1973). "The Fate of Franklin". Ordeal by Ice; the Search for the Northwest Passage. Toronto: McClelland and Stewart Ltd. p. 285. OCLC 1391959. Potter, Russell (2007). Arctic Spectacles: The Frozen North in Visual Culture. Seattle: University of Washington Press. ISBN 978-0-295-98680-7. Savours, Ann (1999). The Search for the North West Passage. New York: St. Martin's Press. ISBN 978-0-312-22372-4. Schwatka, Frederick (1965). Edouard A. Stackpole (ed.). The Long Arctic Search; the Narrative of Lieutenant Frederick Schwatka, U.S.A., 1878–1880, Seeking the Records of the Lost Franklin Expedition. New Bedford, Massachusetts: Reynolds-DeWalt. OCLC 1012693. Woodman, David C. (1995). Strangers Among Us. Montreal: McGill-Queen's University Press. ISBN 978-0-7735-1348-8. Woodman, David C. (1992). Unravelling the Franklin Mystery: Inuit Testimony. Montreal: McGill-Queen's University Press. ISBN 978-0-7735-0936-8. "Franklin Saga Deaths: A Mystery Solved?". National Geographic Magazine. 178 (3). 1990. Beardsley, Martin (2002). Deadly Winter: The Life of Sir John Franklin. London: Chatham Publishing. ISBN 978-1-86176-187-3. Berton, Pierre (1988). The Arctic Grail: The Quest for the Northwest Passage and The North Pole, 1818–1909. Toronto: McClelland & Stewart. ISBN 978-0-7710-1266-2. Brandt, Anthony (2010). The Man Who Ate His Boots: The Tragic History of the Search for the Northwest Passage. ISBN 978-0-307-26392-6. Brown, John, F.R.G.S. (1860). The North-West Passage and the Plans for the Search for Sir John Franklin: A Review with maps, &c., Second Edition with a Sequel Including the Voyage of the Fox. London: Edward Stanford. Coleman, E. C. (2006). History of the Royal Navy and Polar Exploration: From Franklin to Scott: Vol. 2. Tempus Publishing. ISBN 978-0-7524-4207-5. Davis-Fisch, Heather (2012). Loss and Cultural Remains in Performance: The Ghosts of the Franklin Expedition. Toronto: Palgrave Macmillan. ISBN 978-0-23034-032-9. Edinger, Ray (2015). Love and Ice: The Tragic Obsessions of Dr. Elisha Kent Kane, Arctic Explorer. Savannah: Frederic C. Beil. ISBN 978-1-929490-42-4. M'Clintock, Francis L. (1860). The Voyage of the Fox in the Arctic Seas: A Narrative of the Discovery of the Fate of Sir John Franklin and His Companions. Boston: Ticknor and Fields. Lambert, Andrew (2010). Franklin: Tragic Hero of Polar Exploration. London: Faber and Faber. ISBN 978-0-571-23161-4. Mirsky, Jeannette (1970). To the Arctic! : The Story of Northern Exploration from Earliest Times. ISBN 978-0-226-53179-3. McGoogan, Ken (2002). Fatal Passage: The True Story of John Rae, the Arctic Hero Time Forgot. New York: Carroll & Graf Publishers. ISBN 978-0-7867-0993-9. Murphy, David (2004). The Arctic Fox: Francis Leopold McClintock. Toronto: Dundurn Press. ISBN 978-1-55002-523-1. Palin, Michael (2018). Erebus: The Story of a Ship. London: Hutchinson. ISBN 978-1847948120. Potter, Russell A (2016). Finding Franklin: The Untold Story of a 165-Year Search. Montréal: McGill-Queen's University Press. ISBN 978-0773547841. Poulsom, Neville W. & Myers, J. A. L. (2000). British Polar Exploration and Research; a Historical and Medallic Record with Biographies 1818–1999. London: Savannah. ISBN 978-1-902366-05-0. Shapton, Leanne (20 March 2016). "Artifacts of a Doomed Expedition". The New York Times. In 1845, Sir John Franklin set out with two ships to chart the Northwest Passage. He and his crew were never heard from again. Until their belongings began turning up on the Canadian tundra. Simmons, Dan (2007). The Terror. Armonk, New York: Little, Brown and Company. ISBN 978-0-316-01744-2. Wikimedia Commons has media related to John Franklin's lost expedition. Holland, Clive (1988). "Franklin, Sir John". In Halpenny, Francess G (ed.). Dictionary of Canadian Biography. VII (1836–1850) (online ed.). University of Toronto Press. "Llanelli's Lost Arctic Explorer". Llanelli Community Heritage. Retrieved 17 May 2015. "Searching for Franklin". Canadian Broadcasting Corporation. Retrieved 17 May 2015. Terror & Erebus, a chamber opera for six singers and percussion quartet. Cecilia Livingston, Opera 5, TorQ Percussion. Retrieved 2018-01-23. "The Terror - TV-Drama about the crew of Royal Naval expedition in the Northwest Passage". AMC (TV channel). Retrieved 25 March 2018. HMS Erebus was a Hecla-class bomb vessel designed by Sir Henry Peake and constructed by the Royal Navy in Pembroke dockyard, Wales in 1826. The vessel was the second in the Royal Navy named after Erebus, the dark region of Hades in Greek mythology. The 372-ton ship was armed with two mortars – one 13 in (330 mm) and one 10 in (254 mm) – and 10 guns. The ship took part in the Ross expedition of 1839-1843, and was abandoned in 1848 during the third Franklin expedition. The sunken wreck was discovered by the Canadian Victoria Strait Expedition in September 2014. HMS Terror was a specialized warship and a newly developed bomb vessel constructed for the Royal Navy in 1813. She participated in several battles of the War of 1812, including the Battle of Baltimore with the bombardment of Fort McHenry. She was converted into a polar exploration ship two decades later, and participated in George Back's Arctic expedition of 1836–1837, the Ross expedition of 1839 to 1843, and Sir John Franklin's ill-fated attempt to force the Northwest Passage in 1845, during which she was lost with all hands along with HMS Erebus. Beechey Island is an island located in the Canadian Arctic Archipelago of Nunavut, Canada, in Wellington Channel. It is separated from the southwest corner of Devon Island by Barrow Strait. Other features include Wellington Channel, Erebus Harbour, and Terror Bay. The Terror is a 2007 novel by American author Dan Simmons. It is a fictionalized account of Captain Sir John Franklin's lost expedition of HMS Erebus and HMS Terror to the Arctic, in 1845–1848, to locate the Northwest Passage. In the novel, while Franklin and his crew are plagued by starvation and illness, and forced to contend with mutiny and cannibalism, they are stalked across the bleak Arctic landscape by a monster. Petty Officer John Shaw Torrington was an explorer and Royal Navy stoker. He was part of an expedition to find the Northwest Passage, but died early in the trip and was buried on Beechey Island. His preserved body was exhumed in 1984, to try to determine the cause of death. It was the best preserved example of a corpse since the ancient Tollund Man which was found in the 1950s. Man Proposes, God Disposes is an 1864 oil-on-canvas painting by Edwin Landseer. The work was inspired by the search for Franklin's lost expedition which disappeared in the Arctic after 1845. The painting is in the collection of Royal Holloway, University of London, and is the subject of superstitious urban myth that the painting is haunted. Frozen in Time: The Fate of the Franklin Expedition is a book by Owen Beattie and John Geiger, first published in 1987 by Bloomsbury Publishing. The book focuses on the dramatic events surrounding the Franklin Expedition of 1845-1848, led by Sir John Franklin, as well as the scientific work and forensic testing on the bodies of three perfectly preserved Victorian seamen 138 years after their deaths, solving the mysteries of the Franklin Expedition. In 2004, the authors substantially revised the book, adding an Epilogue and altering and updating the text. Margaret Atwood wrote an introduction. In 2017, the authors added a new Afterword to the Canadian edition, and a new Foreword by Wade Davis was added.